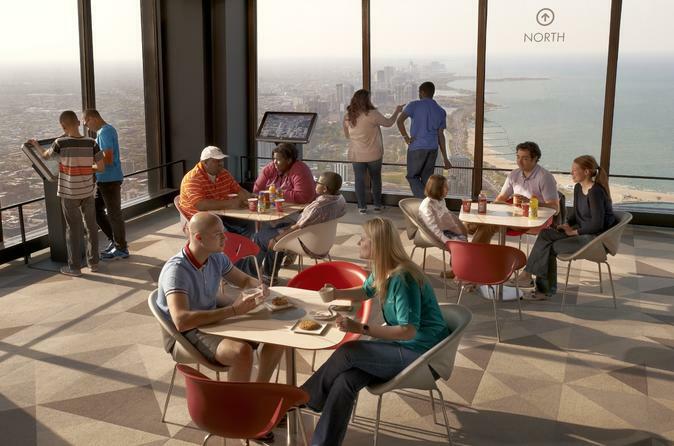 Savor a half bottle of bubbly as you take in spectacular views of the city from 360 Chicago (John Hancock Observatory) with this convenient package. From your vantage point 1,000 feet (304 meters) above the Magnificent Mile, admire top Chicago attractions such as Navy Pier and the Willis (Sears) Tower. Enjoy your half bottle of Italian Prosecco, making toasts high above the hustle-bustle of the streets. This experience, not available for purchase at the tower, is an ideal way to relax and get your bearings or cap off a special night in the city. With mobile tickets, simply scan your phone for direct entry into 360 Chicago. Hand in your ticket when you arrive at the centrally located 360 Chicago (John Hancock Observatory), and receive a voucher for your half-bottle of Italian Prosecco. Step into an elevator that will whisk you up to the 94th floor at a speed of 20.5 mph (33 kph). At BAR 94, present your voucher to receive your Prosecco and two glasses. Take your time drinking your bubbly while admiring 360-degree views of Chicago from the floor-to-ceiling windows. Appreciate the majesty of the buildings all around you in the daytime, and delight in a sea of glittering city lights at night. See Chicago landmarks including the expansive Lake Michigan; the vibrant Magnificent Mile with its many shops and bars; Navy Pier, the city's most-visited tourist attraction; and another famous Chicago skyscraper, Willis (Sears) Tower. Make sure to check out the 80 foot-long (24 meter) wall with murals depicting Chicago's colorful past. After you finish your Prosecco, you may want to also indulge in gelato, coffee, cocktails or the cafe menu. When you've had your fill, head back down to the Magnificent Mile where you'll have plenty of choices for filling the rest of your day or night. Upgrade to the TILT option to access to this brand new attraction of outward tilting glass 1,000 feet above the Magnificent Mile. This is the first of its kind in the world and offers unique, downward facing views.